The K-State women’s tennis team swept South Dakota 7-0 in their spring season opener in Manhattan on Saturday. At the beginning of the dual, K-State’s three doubles pairings each won 6-2. The wins gave K-State the point for the doubles portion of the dual and they took a 1-0 lead. 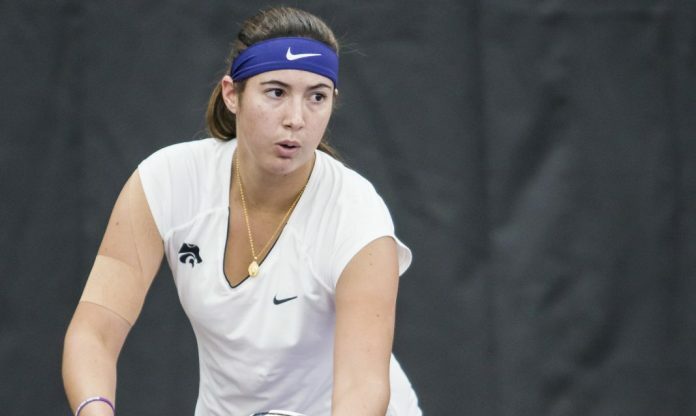 The doubles pairings were sophomore Margot Decker with sophomore Anna Turco, sophomore Maria Linares—last year’s Big 12 Freshman of the Year—with junior Ines Mesquita and freshman Ioana Gheorghita with freshman Maria Ponomareva. The next portion of the dual featured Decker and Turco in singles matches. They each won in straight sets to put K-State up 3-0 on the day. K-State’s Linares took down South Dakota’s Jana Lazarevic in straight sets. The match, which went into a tie-breaker in the second set, moved Linares to 2-0 in her career at the No. 1 spot for K-State. K-State was 4-0. Next up was Ponomareva, who had a singles battle with South Dakota’s Luana Stanciu. The freshman won giving K-State a 5-0 lead. Ponomareva’s classmate, Karine-Marion Job, gave K-State a 6-0 lead with a straight-set win, 6-2, 6-3. Job is a newcomer at K-State, joining the team for this semester. “All three of our freshmen picked up their first wins as a Wildcat today, so that’s always great,” head coach Jordan Smith told K-State Sports. The final match was between Mesquita and South Dakota’s Emma Tranberg. The Coyote took the first set, 3-6, but Mesquita came back to win the last two, 6-2, 1-0. K-State will head to Athens, Georgia, to take on William & Mary on Friday and then the winner of Georgia vs South Florida on Saturday. There will be live updates from Athens on Twitter (@KStateTEN) and on K-StateSports.com.